BAGHDAD, Iraq, June 8 — Al Qaeda's leader in Iraq, Abu Musab al-Zarqawi, was killed in an American airstrike on an isolated safe house north of Baghdad at 6:15 p.m. local time on Wednesday, top American and Iraqi officials said today. Islamic militant Web sites linked to Al Qaeda quickly confirmed the death, saying Mr. Zarqawi had been rewarded with "martyrdom" for his role in the war here. At a joint news conference with Iraq's prime minister, Nuri Kamal al-Maliki, the top American military commander in Iraq, Gen. George W. Casey Jr., said Mr. Zarqawi's body had been positively identified by fingerprints, "facial recognition" and "known scars." Six people were killed in the strike: Mr. Zarqawi, his spiritual adviser and four other people including a woman and a child, the military said. The strike had been accompanied by a ground assault involving American and Iraqi troops. The announcement of Mr. Zarqawi's death, shortly before noon today in Baghdad, 4 a.m. Eastern time, marked a major watershed in the war. With a $25 million American bounty on his head, the Jordanian-born Mr. Zarqawi has been the most-wanted man in Iraq for his leadership of Islamic terrorist groups that have carried out many of the most brutal attacks of the war, including scores of suicide bombings, kidnappings and beheadings. In his late 30's, he had been named "Prince of Al Qaeda" in Iraq by Osama bin Laden, Al Qaeda's fugitive leader. "Today, we have managed to put an end to Zarqawi," said Mr. Maliki, who took office three weeks ago at the head of Iraq's first full-term government since the overthrow of Saddam Hussein. He said the death should be a warning to other insurgent leaders. "They should stop now," he said. "They should review their situation and resort to logic while there is still time." Mr. Maliki, the prime minister, said the raid that killed the Al Qaeda leader had taken place in an area known as Hibhib in Diyala province, which stretches north and east of Baghdad to the Iranian border. The area, 55 miles north of Baghdad, has drawn intensified American military activity in recent weeks in response to a new wave of sectarian killings, including one on Sunday in which Sunni Arab gunmen pulled 20 people, including 7 high school students, off minibuses near Baquba, and killed them. General Casey said an American airstrike had targeted "a single dwelling in a wooded area surrounded by very dense palm forest" five miles west of Baquba, and that "precision munitions" had been used, a phrase that usually refers to laser-guided bombs or missiles. Scenes shown on BBC's World Service television showed a large pile of rubble, apparently from a concrete-framed building of at least two stories, set in an area bounded by palm trees. The BBC footage showed Iraqi villagers clambering over the rubble, with no sign of American or Iraqi troops. The villagers pulled an array of belongings from the 10-foot-high pile of cinder blocks, twisted concrete pillars and steel reinforcing words, and laid them out on the bare earth beside the obliterated building. Cooking utensils, torn carpets and a child's green T-shirt were visible, as was the wreck of a white, Japanese-made pickup truck. A CNN broadcast showed youths picking up a child's sandal and a stuffed toy after the airstrikes, which took place in a neighborhood of about 50 buildings, all in close proximity. The senior American military spokesman in Iraq, Maj. Gen. William B. Caldwell, speaking at a news conference in Baghdad, said the identities of the woman and child killed in the strike had yet to be confirmed. 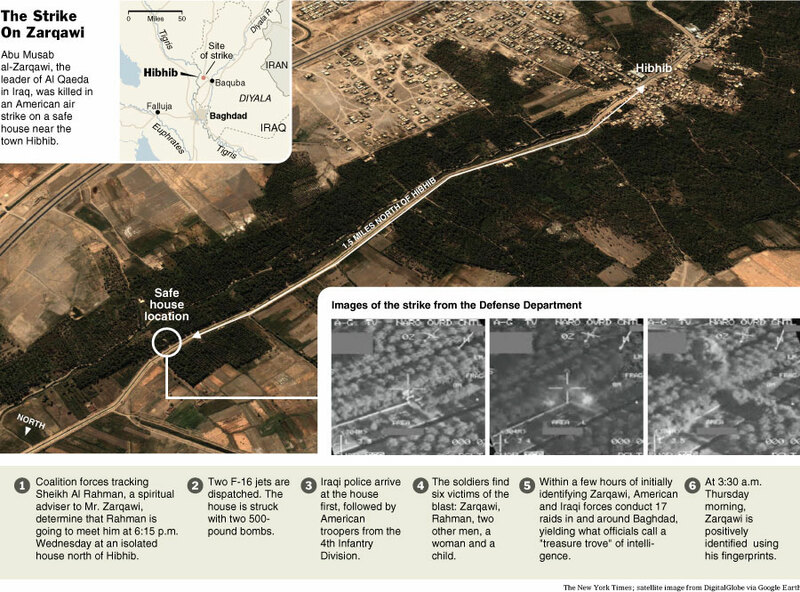 A framed image of Mr. Zarqawi's face after he was killed was displayed at the briefing, as was an aerial video of the two air strikes by F-16 jets, which dropped 500-pound bombs. General Caldwell said dirt and rubble had been cleaned off Mr. Zarqawi's face before the photograph was taken. He also said that Iraqi security forces had been the first to arrive at the scene and that Mr. Zarqawi's body had been removed. General Caldwell said it took many weeks of painstaking exploitation of intelligence, until Wednesday night they had "definitive, unquestionable" knowledge of Mr. Zarqawi's location for the first time. He said after Mr. Zarqawi was killed forces went after other targets in 17 simultaneous raids in Baghdad and on the outskirts, obtaining a "treasure trove" of information. Mr. Maliki said the attack that killed Mr. Zarqawi had resulted from a tip that came from Iraqi civilians in the area, which lies in a province, Diyala, that has an evenly balanced population of Shiite and Sunni Arabs, as well as Kurds. The British prime minister, Tony Blair, at a news conference in London, paid tribute to the role played in the attack by coalition intelligence agencies. "There has been very close cooperation, of course, between everyone — I mean, the Iraqis, the coalition intelligence services and so on," Mr. Blair said..
President Bush, speaking in the Rose Garden of the White House, gave another hint of what happened by thanking American special forces for their role. "Special operation forces, acting on tips and intelligence from Iraqis, confirmed Mr. Zarqawi's location, and delivered justice to the most wanted terrorist in Iraq," Mr. Bush said. 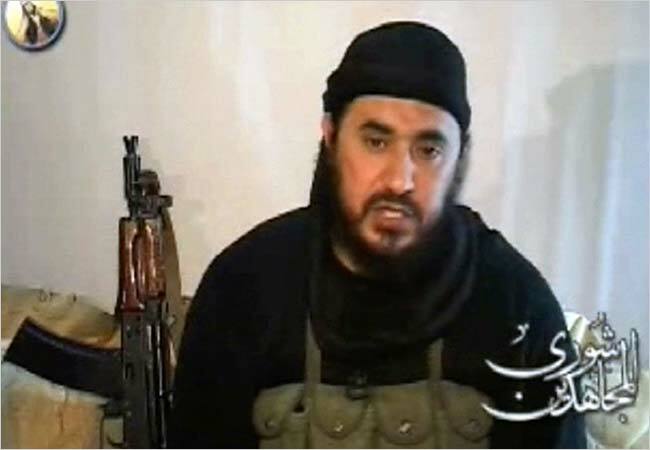 Mr. Zarqawi, whose adopted name was taken from the town of Zarqa in Jordan where the insurgent leader was raised, had assumed an almost mythic status for his long run of terrorist attacks and statements issued on Islamic militant Web sites that declared his goal to be the establishment of a new "caliphate" in Iraq. The term is taken from the term given to the vast areas of the Arab world that came under strict Islamic rule within 100 years of the death of the Prophet Mohammed in the 7th century A.D.
After twice narrowly escaping capture by American troops in the past 18 months, Mr. Zarqawi became increasingly bold in recent months, issuing videotaped speeches on Islamic militant Web sites, vowing victory against the "crusaders" who had invaded Iraq, meaning American, British and other Western forces. The speeches also called on Sunni Arabs to kill "converters," meaning Iraqi Shiites, effectively inciting civil war here. American military commanders have said that Mr. Zarqawi personally beheaded some of those kidnapped by his followers, and identified him as the mastermind of one of the first major suicide bombing attacks, a strike in August 2003 that destroyed the United Nations headquarters in Baghdad and killed 22 people, including Sergio Viera de Mello, the head of the United Nations Mission here. A message posted by Al Qaeda on one of its Web sites, confirming Mr. Zarqawi's death, vowed to continue what it called "the holy war" in Iraq. "We want to give you the joyous news of the martyrdom of the mujahid sheikh Abu Musab al-Zarqawi," the message said. It was signed by a man calling himself Abu Abdel-Rahman al-Iraqi," who was identified as the deputy "emir," or leader, of Al Qaeda in Iraq. The atmosphere at the news conference announcing the killing of Mr. Zarqawi was reminiscent of a similar occasion on Dec. 13, 2003, when L. Paul Bremer III, the head of the American occupation then ruling Iraq, announced the capture of Saddam Hussein in a stifling underground bunker near Mr. Hussein's hometown of Tikrit, 100 miles north of Baghdad. The mood then was one of triumph, with Mr. Bremer declaring "Ladies and Gentlemen, we got him!" and American military commanders describing the capture as a major turning point in the war. Those hopes were quickly disappointed as the insurgency rapidly worsened, and Mr. Hussein, now on trial in Baghdad, has used the courtroom dock as a platform to encourage the insurgents to intensify their attacks on American and Iraqi targets. 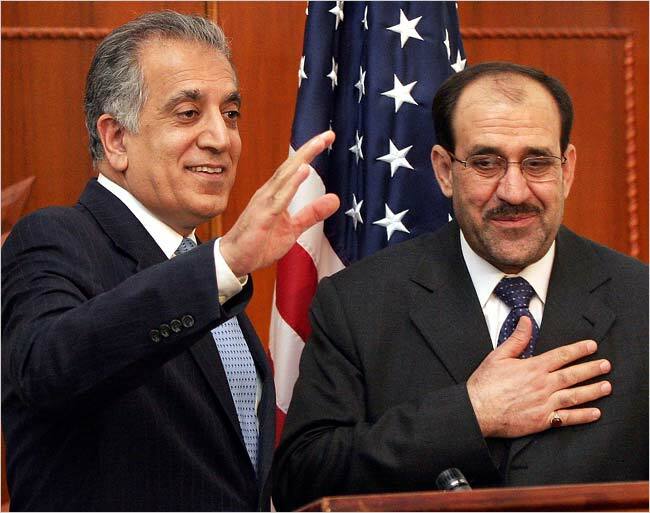 This time, the mood of the American and Iraqi leaders was more cautious, though Mr. Maliki, opening the news conference with the formal announcement of the Zarqawi killing, was greeted by celebratory shouts and cries of "Peace Be Upon Him," the traditional Islamic obeisance to the Prophet Mohammed that Muslims make at moments of joy or special significance. General Casey, nearing the end of his second year as the American commander here, confined his remarks to a spare summary of the raid that killed Mr. Zarqawi. Unsmiling in his rimless spectacles, the 57-year-old general shook Mr. Maliki's hand vigorously after the Iraqi leader made the formal announcement of Mr. Zarqawi's death, but otherwise seemed at pains not to overstate the significance of the moment. Mr. Zarqawi, he said, "is known to be responsible for the deaths of thousands" with his terror attacks, and his death would be a major blow to Al Qaeda. But he added a sober note, saying that "although the designated leader of Al Qaeda in Iraq is now dead," hard fighting in the war lay ahead. "This is just a step in the process," he said. The American ambassador, Zalmay Khalilzad, took a similar approach. Smiling broadly, the 55-year-old envoy described Mr. Zarqawi's death as "a great success for Iraq" in its war with terrorists, and congratulated General Casey, "whose forces carried out this very vital mission." In a personal nod to General Casey, he noted that the American commander "has been here now for more than 700 days" — an oblique way, perhaps, of saying that Mr. Zarqawi's death marked a rare upturn in the war for the force of 135,000 American troops General Casey leads, who have lost more than 2,400 soldiers dead and more than 17,000 wounded, with no end to the war in sight. "Zarqawi was the godfather of sectarian killing in Iraq," Mr. Khalilzad said. "He led a civil war within Islam and a global war of civilizations." To this, the ambassador added a note of caution. "Zarqawi's death will not end the violence in Iraq," he said, "but it is an important step in the right direction." He said it was also an important step for the Maliki government, new in power and facing an uphill struggle to bolster the flagging confidence of Iraqis in the ability of the Baghdad leadership to bring an end to killing that human rights groups say has cost at least 30,000 civilian lives, and possibly many more. But "there will be difficult days ahead," Mr. Khalilzad said. He added, "I call on Iraq's various communities to take responsibility for bringing sectarian violence to an end, and for all Iraqis to unite" behind the Maliki government, which, though dominated by figures from Shiite religious groups, has a cabinet composed of representatives from all three of Iraq's principal ethnic and religious groups, Shiites, Sunni Arabs and Kurds. For Mr. Maliki, a Shiite, the killing of Mr. Zarqawi brought immediate political results in the form of parliamentary approval, immediately after the news conference, of Mr. Maliki's nominees for the vacant security posts in the cabinet, the ministers of defense, interior and national security. After the prime minister's repeated failures to win agreement of contending groups within the government on earlier nominees, he stood at the lectern in the Parliament chamber and presented the three men who emerged from weeks of overlapping vetoes by the main Sunni and Shiite political groups. Named as ministers were Gen. Abdul Qadr Mohammed Jassim, a former general under Saddam Hussein who was jailed in 1994 and sentenced to seven years imprisonment, as minister of defense; Jawad Kadem al-Bolani, a 46-year-old Shiite engineer who was a member of Saddam Hussein's armed forces and became a member of the Iraqi Governing Council in 2003, as minister of the interior, responsible for the police; and Shirwan al-Waili, a 49-year-old Shiite with a background in military engineering who was arrested in the Shiite uprising after the first Persian Gulf war, as minister of national security. 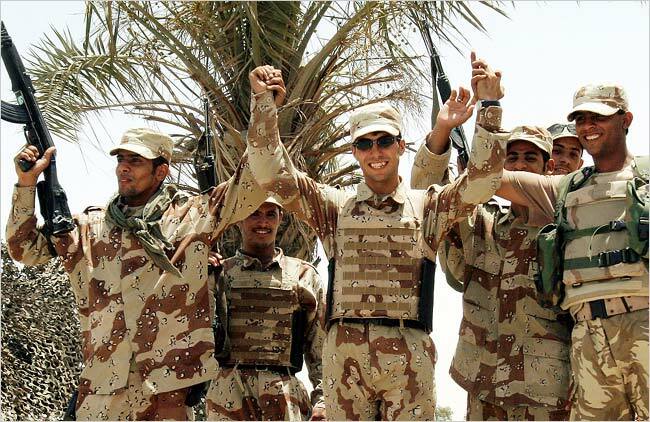 In line with an agreement reached several weeks ago between Sunni and Shiites groups, General Jassim, who has until recently been commander of land forces in the new American-trained Iraqi army, is a Sunni Arab, and Mr. Polani, the interior minister, is a Shiite. Both men stressed in remarks to the Parliament that they had no ties to any of the rival political parties in the government, a qualification that American officials had insisted on after the former government of Prime Minister Ibrahim al-Jaafari was virtually immobilized over allegations that the interior ministry was sheltering Shiite death squads targeting Sunnis. Christine Hauser contributed reporting from New York for this article.